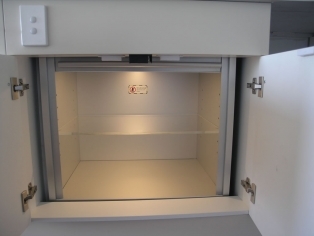 The Dumbwaiters Australia 60kg Under Bench Series Dumbwaiter provides a compact solution for installations where space is limited, or this location is preferred over a more conventional position. The Under Bench Series allows the convenience and full functionality of the Dumbwaiters Australia dumb waiter without the limitations of a traditional design. This range of dumbwaiters is covered by nationwide conditional 2 year (mechanical) and 2 year (electrical) warranty for commercial use.